I began with a printed piece of paper cut down to sixteen images, four by four. I punched a wasp image from a postcard, inked the edges, and added it to the bees/wasps in the upper lefthand corner. For the second and fourth images in that first row, I cut out copies of the book pages and adhered them with dimensional foam tape. I added a piece of gold metal filigree to the Thesaurus page. 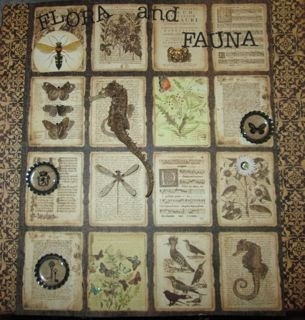 I die cut the letters for "FLORA and FAUNA" and glued those across the top row. For the second row, I cut out another set of the three butterflies and stuck them on top of the paper image, lifted up the wings for dimension, and added tiny black gems for their heads. In the second box I glued a real seahorse over the printed seahorse image. For the third box, I added a piece of floral and butterflies paper and one butterfly sticker for a little color. The last box in that row has a bottlecap embellishment I put together. I started the third row with another bottlecap embellishment. For the dragonfly box I cut out a second set of wings, glued them on, and lifted them up a bit for more dimension. I pop-dotted another D into the next box and added a flower sticker edged with Tea Dye ink in the last box. The bottom row begins with another bottlecap embellishment. In the second box, I added a different piece of floral and butterflies paper and more butterfly stickers. In the next box you'll find a tiny brown bird embellishment from Webster's Pages at the bottom. And for the final box I cut out another seahorse and pop-dotted it over the printed image. I backed this paper with bookboard and placed it on a metal stand on the fireplace mantel. I really love the dimensionality of this piece and I finally have a unique way to display the seahorse I've had since I was a girl. Oh, Girlfriend! You outdid yourself with this beauty! 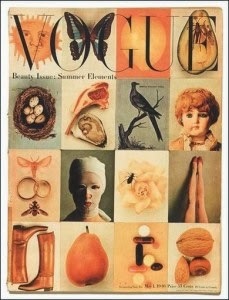 What a perfect representation of the Magazine Inspirational Photo! So many beautiful details on your piece. Just gorgeous!